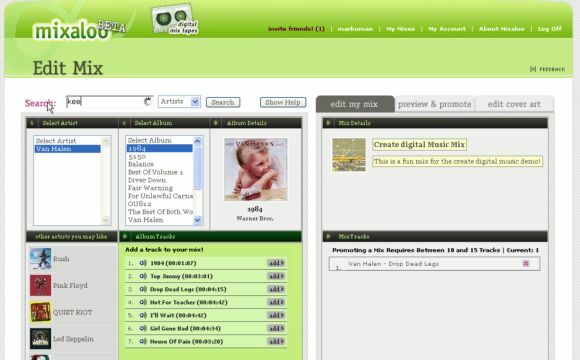 Mixaloo is a new service for building digital mix tapes. Counter-clockwise from upper left: assemble tracks, get recommendations and previews (or add your own recommendations), promote your mix online (via an embeddable widget), and make custom skins and cover art. The Web holds huge potential for music sharing and music discovery, but figuring out how to make that potential work — and how to navigate copyright and licensing laws in the process – has been a major challenge. This week, the creators of the website Mixaloo promised to “bring mix tapes into the digital age.” Whether you buy into that concept or not, or their particular implementation, the site does demonstrate both some of the opportunities and legal hurdles in Web sharing. They also inherit the closed model supported by labels (no full streams, previews only, DRM), but already that’s changing (MP3, and the promise, hopefully, of full-length tracks soon). It’s like a microcosm of the whole business at the moment. Mix your album from 3.5 million + tracks. 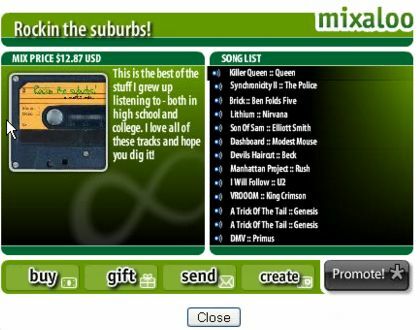 Embed players and market mixes on Blogger, MySpace, Facebook, Friendster, etc. Mix Tape 2.0: skinnable Web widgets. But with 30-second songs, you may be looking for your Panasonic tape boom box; I know I am. So, labels, get it together — especially since commerce here is the aim. So that’s the good news — now the deal-killer. For now, Mixaloo supports only 30-second previews, which to me pretty much defeats the purpose. (Mixaloo says that “the feedback we’ve gotten across the board has been positive” after several thousand users on the beta, but I think the service will fail to catch on until they can get full-length streams.) They do say full-length tracks are something they’re talking to the labels about, without making any specific promises. The trick with all of this is not necessarily to sign with a major label, but simply to get hooked up with the right online distribution outlets. Once you do that, you can connected with any number of online music outlets. There’s no saying whether Mixaloo will or won’t take off, but you’ve got plenty of other online tools to try. The Mixaloo team advises that “for an independent artist, the path of least resistance would be to register with a CD Baby for digital distribution,” while indie labels (of which we have a few reading this site) might work through Iota Music Publishers or The Orchard. And this approach also works for sites like Pandora; see our interview there for thoughts about how people might use these various tools, and how musicians could benefit from them. Digidesign Pro Tools Vista Support: Say Wha?